Combit Studios will work closely with River City Ransom rights holder Million to ensure it is the best game it can be for fans on both continents. 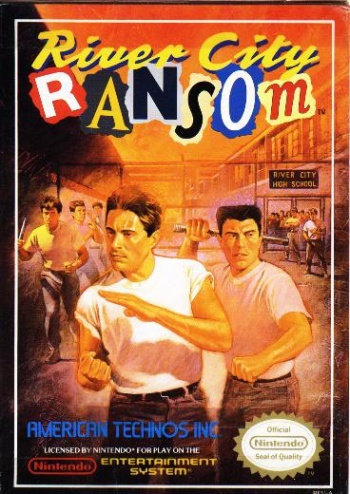 River City Ransom was an great little NES beat-em-up, known as "Downtown Hot-Blooded Story" in Japan. The plot follows high school students Alex and Ryan as they cross River City in an attempt to rescue River City High and Ryan's girlfriend Cyndi from the clutches of a villain called "Slick." It was really fun and combined elements of traditional side scrolling beat-em-ups with RPG and open world features. It was released over 20 years ago, but aside from a remake for the GBA in 2004, titled River City Ransom EX, it has never really seen a true sequel. An announcement for River City Ransom 2 popped up a few years ago, claiming to be coming soon to WiiWare, but that project has been put on indefinite hold. Now, independent developer Combit Studios has announced that it will work with River City Ransom rights holder Million to produce a true sequel to the classic NES beat-em-up. "I am beyond excited to reveal today that we have started development on an official, worldwide follow-up to River City Ransom. With strong followings in North America and Japan, we will work closely with Million to ensure it is the best game it can be for fans on both continents." Combit tells us that it has "assembled an amazing team of some of the most ardent fans of the game, each bringing their unique talents and imagination to what we hope will be the follow-up game you've always wanted to play." The game is currently slated for a 2014 August release date for the Windows platform, although the developer says that other platforms are under consideration. A crowd-funding campaign for the game will launch this summer, where fans will be able to "claim some truly unique rewards, and to help us bring you the next chapter that River City Ransom deserves!" You can subscribe to a mailing list on the official River City Ransom website. Retro City Rampage, an open-world beat-em-up released for various downloadable platforms last year, was inspired by classic beat-em-ups like River City Ransom.